For more than 20 years, Kathie Thoming of Fairfield has educated expectant parents about childbirth and infant care. As an adult educator with the NorthBay ABC (A Baby’s Coming) Clinic, Thoming teaches most of the maternal/child health classes listed in this Wellspring. Now she has a new mission— to raise enough money to give 100 new moms a “Heartbeat Bear” as a parenting tool. The bear makes the sound of the womb, which is comforting for newborns. 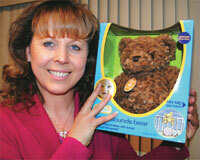 The bears are created by DEX Baby Products in Vacaville, which offered a special reduced price for 100 bears. Thoming visits service clubs to present her idea and is half-way to reaching her goal. She uses the bears as incentive gifts for women participating in the ABC Clinic prenatal classes. Participants are low-income by definition, and often have many hardships that get in the way of their taking prenatal classes, Thoming explained. If she gives out 100 bears this year, it means that she will double the number of women who completed the entire education program from 2009. For more information about the 100 Bear Project, e-mail Thoming at babybusiness@att.net.